Enjoy the spooky attractions and shows at Six Flags America during Fright Fest, one of the Baltimore/Washington, D.C. area’s largest Halloween celebrations. The annual event features thrills for everyone, family-friendly activities during the day and haunted thrills at night. If you like to ride roller coasters, this is a great time to visit the theme park as the lines are much shorter than during the summer season. Thrills By Day (Noon–6 p.m.): The park has a festive fall harvest feel with lots of friendly ghosts and ghouls for kids of all ages. Family-friendly attractions include the Kids Halloween Dance Party, Monster Mash Bash, Stage Fright: Starring Joe Romano and much more. Fright By Night (6–10 p.m.): As the park goes dark, creepy, crawly, creatures come out to play. Fright Night features 15 haunted attractions with six all-new shows and events. Please note that many of the Fright by Night events are not recommended for guests under 13-years-old. During Fright by Night there are four Fright Zones throughout the park. Zombie, ghouls and clowns will greet and, in some cases, chase you as you walk through the area. There's no where to hide, so be prepared to face them head on! Ghouls of Six Flags America: With the help of expert make-up artists applying bubbling skin, rotting wounds and gaping sores, 150 entertainers transform into zombies, vampires, demons, and evil carnival characters for Six Flags America's Fright Fest, the region’s biggest Halloween celebration. Looney Toons and Halloween Costumes: During the daytime, kids can enjoy family-friendly activities at Six Flags America. Children 12 and under are permitted to wear costumes and face paint. No masks are permitted in the park. Guests will be required to remove such items for safety reasons. The kids will love the Halloween Trick-or-Treat attraction full of exciting decorations and yummy treats. Terror Toy Shop at Fright Fest: Six Flags America's new haunted house, Terror Toy Shop, has a holiday theme including wicked elves who are scheming with Santa Claws to plan a reign of terror. The house is filled with demonic teddy bears, demented dolls and twisted gingerbread men who terrorize guests as they venture through this new haunted attraction. The Procession: At 6 p.m. the ghouls of Six Flags America rise up and parade around the park. They start at Cyclone and make their way to GOTHAM city arena. If you miss the procession, don't worry! You'll see them again while you walk around the park. Fright Fest runs September 22–October 28, 2018 on weekends. On Saturdays, expects scares from noon–10 p.m. and from noon–11 p.m. on October 20 and 27. On Sundays the event lasts from noon–9 p.m. It's also open on Friday, October 19 and 26, 5–11 p.m.
Six Flags America is located on Route 214, Central Avenue, in Upper Marlboro, MD, approximately five miles from I-495 and just 30 minutes from downtown Washington, D.C. See Driving Directions. Hours vary by day so be sure to verify the schedule. Guests over 13 years old can't wear costumes and no masks are permitted in the park. Arrive early to get the most out of your visit. There's no reentry to the park after 7 p.m.
With more than 20 attractions, there is a lot to see and do. Take a look at the schedule of events and plan ahead. 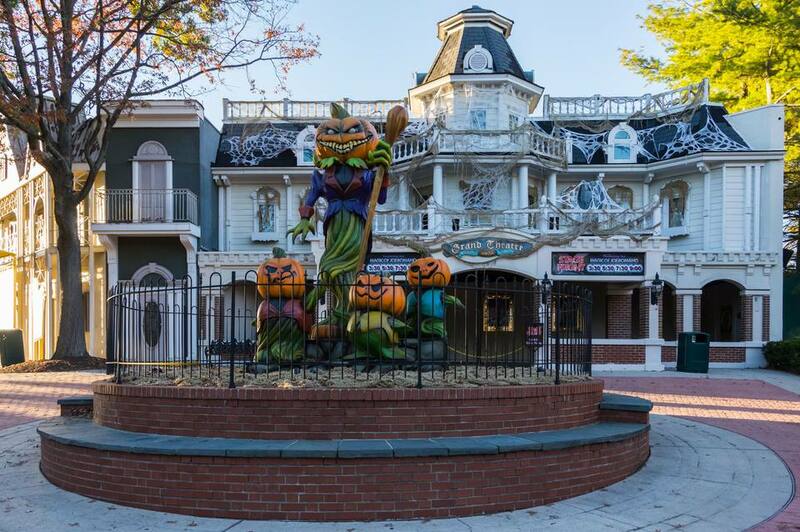 Be sure to get a map of the park as well as a map of Halloween attractions. Plan your visit around the show schedules. Give yourself enough time to experience some of the rides. Make sure to see the Magic Show by Joe Romano and stroll through the Terror Toy Shop. Relax and enjoy the thrills.